The Science of Handreading in Psychological Diagnosis. 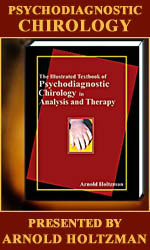 After the publication of his first book in 1983 'Applied Handreading', Arnold Holtzman (Ph.D. in Psychology) presented in 2004: 'The Illustrated Textbook of Psychodiagnostic Chirology in Analysis and Therapy'. The book includes a combination of fascinating materials: a thorough theory about the human hand + beautiful illustrated photo-materials, which often present rather remarkable hand-features. PDC is definitely a fascinating master-piece of modern hand reading, and Holtzman's work will likely be recognized by the experts in this field as one of the few milestones in the history of hand reading. First, this review will describe the postion of PDC in the field of modern hand reading. Second, the introduction of 'The PDC hand model' will describe the theoretic framework behind PDC. Third, the importance of the thumb will be explained. Fourth, a short description of the PDC laboratory testing will be presented. And finally, the position of PDC in academic science and therapy today, will be discussed. • 2 - The PDC hand model. • 3 - The thumb is an important aspect in PDC. PS. If you 'click' on the BOOK below you can see more pages from Holtzman's book!! Martijn, I read his earlier book many years ago, and I found it overwhelming! Now I am interested in getting a hold of this one, but he has stopped taking orders, and the prices elsewhere have been astronomical. I found his attempt to tie in psychoanalytic theory and palmistry fascinating and innovative. I also met someone who had had his hand read by Holtzman, and he said that it was an enlightening experience (this fellow was very skeptical at that time... but he said that Holtzman's accuracy was remarkable). PS. Holtzman is considering various posibilities, including publishing a reprint, but his thoughts indicate to me that it will probably take another year (likely even more) because he prefers that any new publication should include an update. What I like about these two books is that the authors' approach is quite unique and non-traditional. Thanks for your recommendations Truth Seeker! My palmistry collection of books is starting to expand significantly! Any book that is original and based on sound experience and observation is most welcome! Nice to see that you like this topic! I am an enormous fan of Arnold Holtzman and have been ever since I became a Certified PalmTherapist (Moshe Zwang technique). I'm so happy to see your comments recognizing and commending him. Thank you Martijin. It could be the most 'tempting' hand reading systems of Arnold Holtzman in the world as they say, but, in the wrong way especially when I read his analysis of Barack Obama’s hands. Many revelations about Barack Obama not proved right; but, revelations expressed here by members on this forum proved right instead. I think he had been prejudiced then. According to him, he has The Negative Oral Personality, Cognitive Dissonance, Split Loyalties, Impotence of Will, and Paranoia. He further says: This is definitely not a feature one would like to find on a person with the power available to the president. See further, he says besides that all said above: He has A Vacant Self: The Total Bankruptcy of Motivation. OMG. My question is if Barack Obama has above mentioned personality traits in him than all the American those who have chosen him (once again recently) as there Leader, President are definitely sensless or Arnold Holtzman’s system did not work at all. Regarding ‘The Deficit Father Syndrome/Peer-Group Rejection’ I have to say that it seems he has linked his life story findings with his formations of hands or fingers. No sign is absolute in itself. Everything affects everything thing. It may be possible but my son has very longer ring finger definitely the index finger substantially shorter than his ring finger. He has never been rejected or abandoned by me. He cares for me and I love him very much. I hope culture matters. He is attractive, popular, earns a lot and provides us all things which he becomes to know, even without asking me. He truly loves me and cares and shares a lot with his mother too. I am not blaming or criticizing Arnold Holtzman for his analysis of hands of such an extremely popular the most powerful Leader on the Earth which he did in a wrong way. My intention is not to hurt anybody’s believes here. I want to know his or anybody’s convincing reply on the matter for my curiosity only. Thanks. Thank you Parender for your comment. I really appreciate what you have pointed out and definitely agree that one cannot look at only one aspect in the hand. The analysis that i used to read of his, where his patients. I didn't give much credibility or find the celebrity hands as useful. When studying his comments regarding some of his patients, i found that similar analysis was accurate for some of my clients. What books or authors do you consider helpful and accurate? 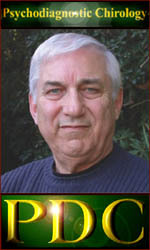 ellencbrown wrote: I am an enormous fan of Arnold Holtzman and have been ever since I became a Certified PalmTherapist (Moshe Zwang technique). I'm so happy to see your comments recognizing and commending him. Thank you Martijin. The 53 pages addendum featured in 2nd edition of the book is also available for those who already own a copy of the first edition (see also: http://pdc-psyche.net/ind1.htm ). Thanks for this wonderful reference, I am hoping to have hand analysis as a tool for counseling once I have finished my degree etc. I ordered the addendum to go with my book which I purchased back in 2008, but the website refunded me saying I couldn't purchase because I need the book first..:-( I will try to contact them on the website. I paid for the book by pay pal, and pay pal refunded me. The text book I have was also paid by pay pal back in 2008. The website doesn't have a contact for queries. I did find an e-mail and wrote to it, but it failed to send saying the email doesn't exist. (bit annoyed here). I have now succeeded in paying, for some reason the Paypal was not coming up on my Safari or Firefox- maybe my old Mac won't let it update, so looking forward to reading it!